﻿Who doesn't love giveaways? I sure do and I'm betting that all of you do too. 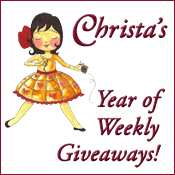 Well Christa of Christa Quilts announced today that she is going to host a whole year of weekly giveaways on her site. Wow! That is fantastic and super generous of her. I didn't know about Christa's great shop until just recently and to be totally honest, I haven't bought anything from her YET. With my upcoming big expenditure for my long arm, I've been behaving but there are some new lines coming out soon that are on my "Must Own" list so you know that I won't be behaving for much longer. Now I could have just entered the giveaways and not told you about this too but that would have been selfish and just isn't my style. I'd rather spread the quilty love. So head on over and enter yourself. This week's prize is this cool Olfa Blue Splash Rotary Cutter. More color in our sewing spaces is good. I'm sure it will look great in my tool bag. And I'll happily accept your congratulations when I win each week. Just kidding, of course. Or am I? Those of you that have read my blander for a while know what a goof ball I can be at times. No really, I hope there are a lot of very happy winners in the coming 52 weeks. I just hope that I am one of them. Sign up to receive Christa's blog posts directly into your Inbox so you don't miss out on the chance to win each week. You just might be very glad that you did. This has been a Quilter's Public Service Announcement! So nice to share the news! I have ordered several times from Christa's Quilts and always receive my fabrics within a quick turn around with excellent personal service. I would highly recommend her shop...lots of variety in fabrics, kits, and notions. Thanks! Off to check it out! I have been loosely following you getting a long arm - will you be putting yourself out there for people to send you quilts when you get acquainted with it? Absolutely Tiffany. Surprisingly enough I already have 1 person wanting me to quilt her top when I’m ready and she has it finished. Hopefully by the end of the summer I’ll have enough skill to quilt for others, but I’m a bit of a perfectionist so I want to make sure that I can do a good job before I consider quilting for others. I’ll definitely post something on my blog when that time comes.